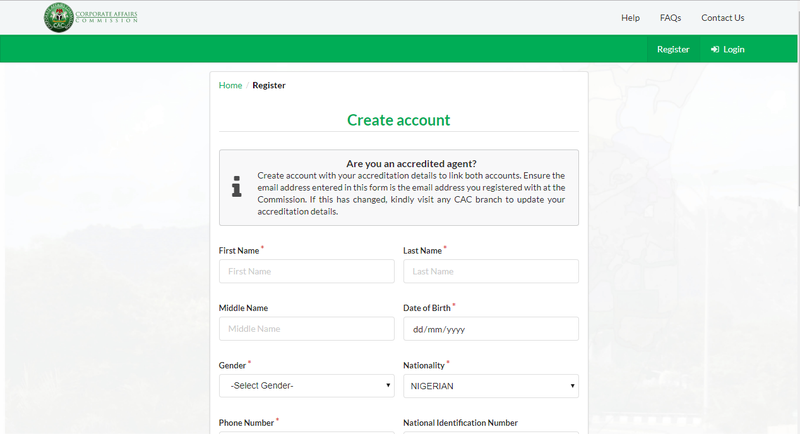 If you are looking for a way to register a Business name or Enterprise in Nigeria without falling into the hands of scammers that are everywhere these days, the easy alternative is to do it yourself from the comfort of your PC on the online CAC online portal. I have registered a couple of Business names in the past months right from the comfort of my PC, this post will guide you on how you can also register your own business name by yourself online. 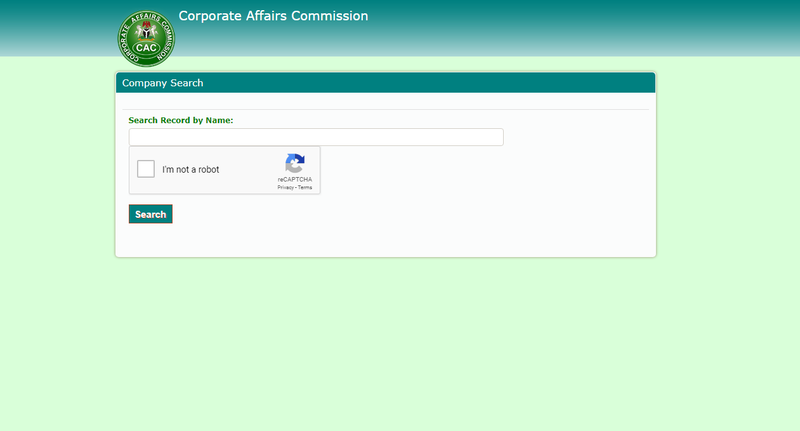 Remember, the Corporate Affairs Commission allows individuals to do Business name registration by themselves without any third party. So, there's nothing to worry about - just follow the steps. Well, regardless of your search queries, the step-by-step guide to registering your Business name online is here; just sit back and follow the instructions. 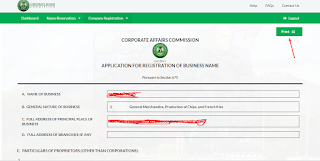 However, since we are only interested in registering Business/ Enterprise name online, I will be focusing on the use of the CAC website stated above. If you already have an account, you can skip that step and go to Step 2. 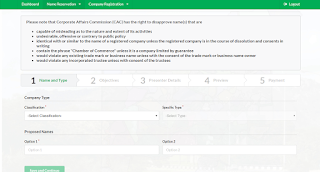 Before you can proceed to registering your Business name, you need to be sure that your intended business name has not been registered already by someone else. You CAN NOT register a Business name that is already in the database, so make sure you are as creative as possible, ensuring that the name you choose is 100% unique. Enter the name into the box to find out if someone else is not using the name, if not on the list, you can go ahead and use the name in the next step. Before you move to the next step, make sure you have two name options. It is the Corporate Affairs Commission that has the final say, so be sure you have two strong options; only one out of the two will be approved. 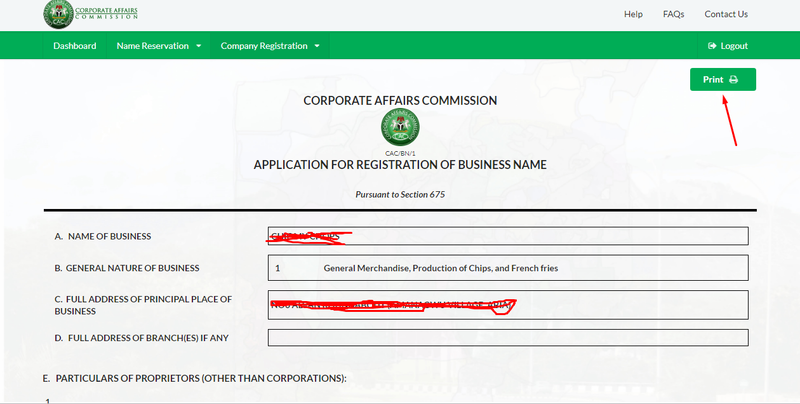 You can NOT register a Business name that ends with Limited or LTD e.g Naija Loaves Limited. It will be rejected. 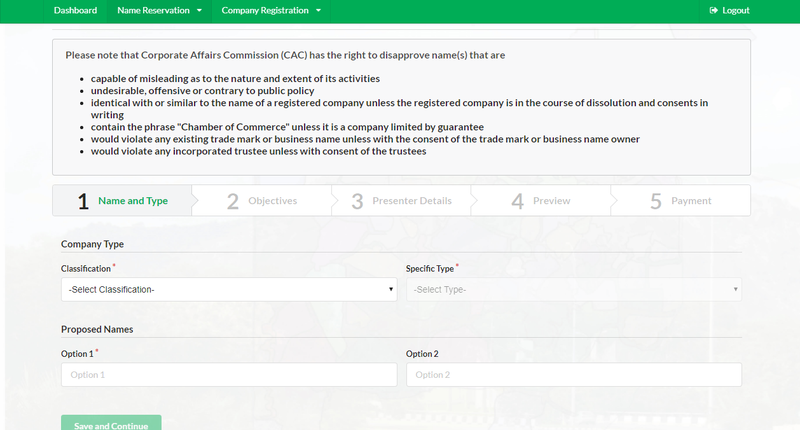 It can not contain the word "Group", or "Chamber of Commerce"
Now that you have the Business names you want to register, it is now time to inform the CAC of your interest and therefore make reserve the name for you. To apply for name reservation on the CAC website, click this link or click Reserve a Name on your CAC Dashboard. 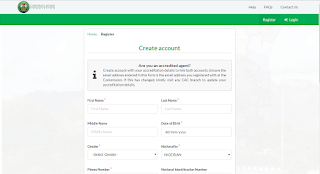 On the form, you will fill-in the required fields with all the correct information until you get to the page where you will be made to pay the sum of 500 Naira for Name Reservation. How long does it take to get the Business Name Approved? They usually respond with decision on your Business Name within 24 hours (on Business days). You will get an email to that effect if your application was approved or rejected. To avoid getting rejected, it is recommended you read the instructions on this page and also on the website, so you don't continue wasting 500 Naira for name reservation. 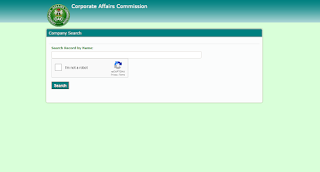 Successfully approved names will be made unavailable for other people to register for a period of 90 days, during which you will be expected to pay for the final Business Name registration and get your Unique Registered Company Number (RC). If your application for Name reservation was approved in the previous step, Congratulations! I believe you must have gotten an email from the website containing your Name Availability Code. You will find that in the attached document in the email you received about its approval. On the next page, you will be asked to Enter your availability code, just paste the code you got in the Email you received then the application form to complete your Company registration will be generated. Once again, Fill the forms with all your correct details. 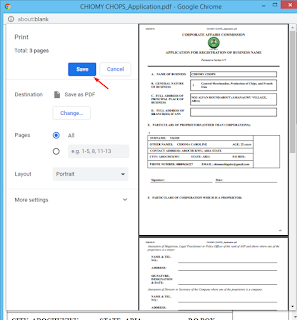 On the part where you are asked if you need Additional Certified True Copies, don't choose anyone, you don't need that column for Business/ Enterprise name registration, so click "Save and Continue" to see an overview of your application and proceed to making Payment. How much do I pay for Business name registration? You will be required to pay 10,000 Naira via any of the accepted means available on the Payment Page. After successful payment, you will get a notification to that effect. 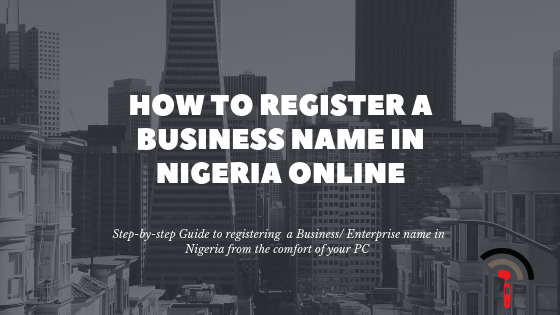 ATTENTION: According to the Federal Government of Nigeria, From October 1st 2018 - March 31st 2019, the cost of Business name registration will be 5000 Naira instead of 10,000 Naira. Take advantage of this opportunity. 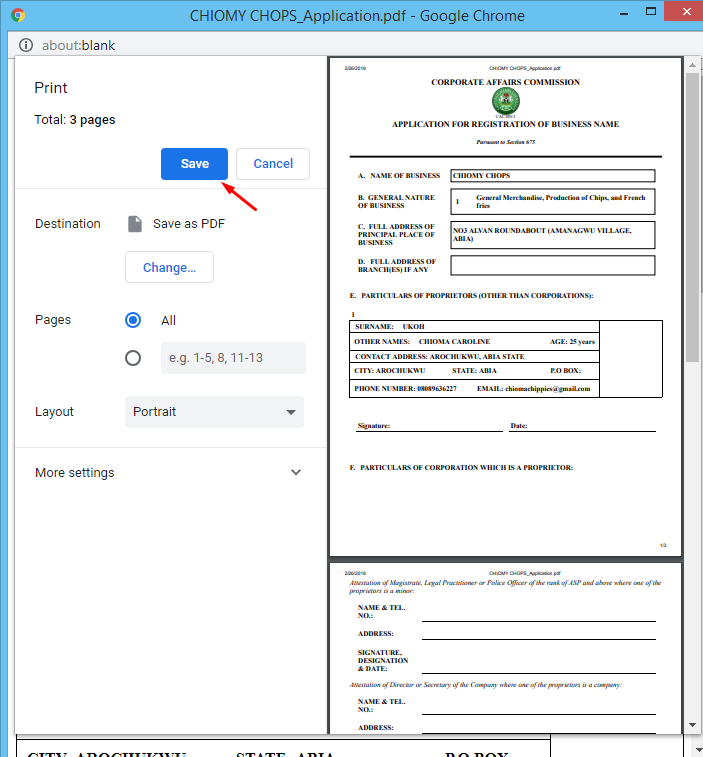 To download the document, click the title, and select Print, the print interface will show up, Click "Save" to download the document to your device. The last step in Business name registration is the uploading of the business name registration form, and other documents stated earlier. Enter your CAC Availability Code and start uploading the documents. If you have any questions, drop it in the comments section below, and if you like to hire me for this service, you can Contact me. I will always keep this Guide updated to reflect any necessary update!